I am a calendar and planner lover. I love lists and making goals and seeking to make the most of my days. I’m also aware how easy it is to become overwhelmed, miserable, and exhausted when I don’t have a good plan in place to make the most of my days. 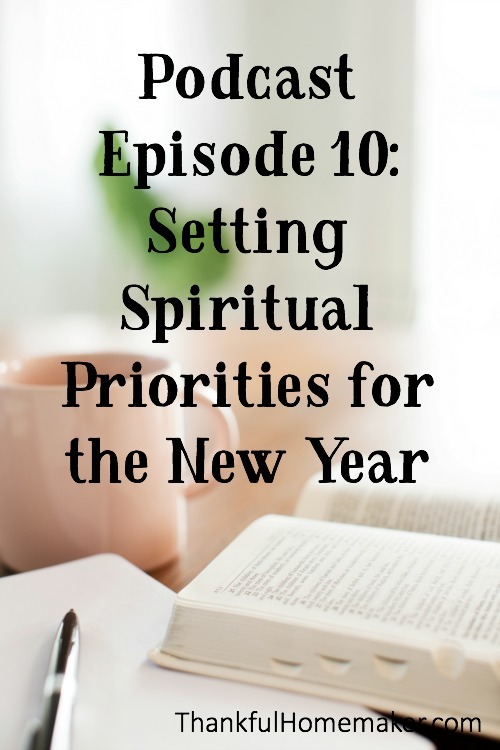 I want to share today a system I’ve used for years on planning my spiritual priorities for the year. It has helped me to focus and build my choices in light of biblical priorities. It comes from a great little resource called Shopping for Time by Carolyn Mahaney. This resource that crossed my path several years ago and challenged me in the area of spiritual goals for the New Year. I realized if I didn’t plan and spend time in prayer of how I was going to grow spiritually not much growth would take place. For several years now I have spent time planning areas of my spiritual life where I would like to see growth. I review my spiritual priorities at the start of a new year and refer to them every month to see how I am progressing. One reason I do this every year is because our lives are made up of changing seasons. Care for my physical health. ~ Jean Fleming excerpt from Discipleship Journal called A Personal Retreat: A Special Date with God.